Looking for some fun activities to share with your family while enriching speech and language development. Follow the link for MassVacation.org to explore your own backyard. Games to Make Artic Therapy Fun! Articulation (speech) therapy can get repetitive at times, especially if you're working with a child who has a lot of sounds to work on at the word level. Rather than just repeating one sound after another, we've got a couple of tricks up our sleeves that we like to use to help a little kiddo forget they're actually doing speech therapy! Cut out pictures with the child’s target sound and take turns hiding a sticker under a card – the child tells you cards to flip over (thus practicing their speech sound) to see if the sticker is underneath! You can also do this for auditory discrimination tasks with pictures of minimal pairs and YOU tell the child where to look. Drop coins or tokens into a jar; when it's filled the child gets to play a game! Make a copy of a sheet of pictures of target words and then play “Go Fish” looking for pairs – each time the child asks for a specific card, they’re practicing their target sound! Any toy or game that involves multiple repetitions of an action… The child can earn a turn or piece of the game with every trial, or every X number of trials if the game has fewer turns/pieces or if the child is older)… Here are a few examples, but just about any game can be turned into artic practice! Check out one of our latest activities to help our kids get into the mind of a character! First we read a story (The Bravest Dog Ever: The True Story of Balto, by Natalie Standiford), and then retold it, using the Story Braidy Grammar Marker (they've got an app now, too!) as a visual cue to remember the components of a story. Next, for homework we had the client pretend to be one of the characters in the book and write a letter as that character. Read on to see what he wrote! Wait until you hear about Batlo's latest adventure! :) We were here in Northern Alaska and even though it was summer, there was still a lot of snow on the ground. There was an avalanche and there was a hiker trapped in the snow. The people who saw the avalanche tried to rescue him, but they could not. People called an ambulance but it could not get there because the roads were covered in snow. So they called Balto. Balto rescued the hiker with his sled and brought the hiker to the hospital. Looking for more speech therapy activities? Check out some of our other blog posts for ideas about speech therapy materials and activities!! Happy Thanksgiving eve! We are looking forward to all the food and family time tomorrow, and hopefully you are too. Many of the kids here at SLPC have been preparing for Thanksgiving by reading all about it and holding a "practice" Thanksgiving with their therapists and stuffed animal friends. This is a great way not only to get a child talking and anticipating the sequence of events on the big day, but also to prepare him or her for the sensory aspects of Thanksgiving. If your child has autism, sensory processing disorder, or other special needs that affect their sensory processing system, practicing before the big day can help reduce the stress of the holiday. Because Thanksgiving revolves around food, take a moment to discuss the different shapes, colors, smells, and tastes of the foods you'll be eating. What will the turkey look like before it's cooked? What about afterward? Will the potatoes be crispy like French fries or soft and mashed? A pie starts out as a circle, but what shape does it become when you cut it up? Talk about how the routine of the day might change. Will your child wear something different than he or she usually does? Will you be going to someone else's house? Will there be other children there to play with? If it helps, you can make a schedule with your child that outlines the different events and possible break times to get away from all of the noise and excitement. Last but not least, when getting ready for a change in routine or a new sequence of events, it's important to play a lot! 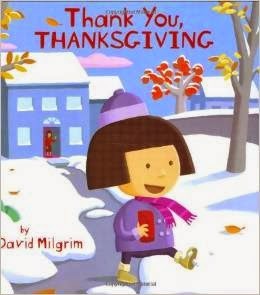 After reading about the holiday, try some pretend play revolving around Thanksgiving. At the clinic, we went grocery shopping, invited some friends over, cooked our turkey, mashed potatoes, and desserts, and had a delicious feast with friends! (Of course, we also washed the dishes afterward.) For kids who might have trouble with the play sequence, we made a visual schedule to show them what to do. e hope you all have a happy Thanksgiving! For more news from us, visit our websiteor "like" us on Facebook. Make homemade play dough together following this easy recipe. Add glitter, food coloring, or spices such as cinnamon to add an extra sensory component. If your child is prone to putting items in his or her mouth, try out this edible play dough. Read Jan Brett's The Mitten, a story about animals that stay warm in the snow by burrowing into a boy's lost mitten. Then, retell the story with your child by using these props from Jan Brett's website! Write and mail Valentines together. This is a great activity for sequencing and vocabulary skills. You can even have your child dress up as a mail carrier and pretend to distribute Valentines to family and friends. For a book to go with this activity, try The Day it Rained Hearts by Felicia Bond. Make your own indoor snow by mixing 3 cups of baking soda with 1/2 cup hair conditioner. Add toy vehicles, people, and animals and get creative playing with them! Alternatively, bring in a tub of snow from outside and allow your child to play in it with his or her cold weather clothes on. Valentine's pudding: mix up plain vanilla pudding and add some red food coloring or beet juice. Top with sliced strawberries, raspberries, mini chocolate chips, or sprinkles. Make "I spy" bottles together. The possibilities are endless, as shown bythis Pinterest board! We hope this list helps ward off boredom while encouraging language development! We'd love to hear your ideas for activities as well; please comment below or on our Facebook page! Thanks for reading! To learn more about our speech, language, and feeding services,click here. Maybe your New Year’s resolution is to update your family’s toy closet, or you’re looking to use up gift cards left over from the holidays. Whatever the reason, we always encourage parents to purchase games that are not only fun, but also encourage speech and language development! Below are our top five toys for speech and language development, many of which can often be found at local garage sales or consignment shops. At five dollars each, these are quite a bargain! Each set contains several picture scenes and stickers to use with each background. These are great for encouraging vocabulary development, requesting, following directions, and understanding or using prepositions such as in, on, and under. Our favorites are the Play House and Habitats sets. Suitable for children ages 3 and older. If you’re looking for a game that is never predictable and will help promote higher-level language, this game is for you. Players take turns choosing an item from the room to hide in the cat’s hat. Then, other players ask questions (with help from picture cards) to try to figure out what’s inside the hat. This game is great for working on answering and asking questions, using descriptive language, deductive reasoning, and memory. Suitable for children ages 3 and older. Many children love to care for babies, and it’s also a great toy for expanding language and play skills. At the SLP Center, our baby doll includes a tub and items for bathing and feeding the baby. Baby dolls are versatile and can help work on many different skills, including: vocabulary, following directions, labeling actions, understanding functions of items, and sequencing. Suitable for children ages 1 and older. Another versatile game, the Critter Clinic is a favorite of many of our clients! This veterinary set comes with a stuffed dog and cat, but you can hide any toys from your own collection in the various doors. This is a great game for more simple language (e.g., requesting “open” or “help”), as well as more complex language. Like the baby doll, the Critter Clinic provides ample opportunities for pretend play and the language that comes with it. We also like to hide objects that contain the sounds our clients are working on! Suitable for children ages 2 and older. We enjoy using food sets from Melissa and Doug, such as their pizza set and cookie set, but our clients also love going “grocery shopping” with our other play food! This is another toy that encourages sequencing skills (e.g., making a shopping list, choosing food, taking it to the cashier, and paying). Playing with food can also support development of the following language skills: requesting, vocabulary development, asking and answering questions, labeling actions, using descriptive language, and conversational skills. We also target our clients‘ sounds with foods containing those sounds. If they are working on the “s” sound, why not go shopping for soup, salad, sandwiches, and salmon? For even more play ideas, try pairing the play food with a local grocery ad or a real cooking experience! Suitable for ages 2 and older. We hope you’ve enjoyed hearing about our favorite toys, and we’d love to hear about some of your favorites! Happy playing! Disclaimer: No products or financial incentives were provided by the makers of these toys, and there is no relationship (financial or otherwise) between the SLP Center and the above toy companies. First, we finished reading It's Pumpkin Time! by Zoe Hall. For our pumpkin theme, we had started reading this story, which is about children who grow a pumpkin patch. Last week, we finished the story and found out what they did with all those pumpkins. We continued to practice new vocabulary words we had learned, such as vine, seed, andwheelbarrow. We also learned some new words, including jack-o-lantern, costume, and trick-or-treating! Everyone had fun predicting what would happen next in the book and talking about their own experiences with carving pumpkins and dressing up in costumes. After we finished the story, we "carved" our very own pumpkins! This is a great craft to teach actions, vocabulary, body parts, requesting help, and combining several words into a phrase. We also worked on "p" sounds ("pumpkin", "pulp"), "s" sounds ("scoop", "seeds"), and "k" sounds ("cut"). Afterward, we worked on sequencing skills by putting pictures of the pumpkin-carving process in order and talking about each step in the sequence. We glued the pictures onto notecards to make a book that each child could take home. Interested in re-creating this activity at home? Follow the instructions below! Have an adult use the box cutter to carve the craft pumpkin beforehand. Add seeds and yellow yarn for pulp to the inside of the pumpkin, and then reassemble it. Allow your child to use a plastic knife to "cut out" the top of the pumpkin. Use a spoon to scoop out the seeds and "pulp". Use the plastic knife to "cut out" the rest of the pumpkin parts. Turn on the battery-operated candle and place inside, then put the top back on the pumpkin. We hope you've enjoyed reading about our speech and language adventures! Don't forget to share this post on Facebook and visit our website (www.slpcenter.com) for more information! Apples are a favorite fall topic - we had a fun time discussing how apples grow, going apple-picking, and what we can do with apples. Apple Farmer Annie by Monica Wellington and Apples and Pumpkins by Anne Rockwell are great books for younger children. While reading them, we practiced answering wh-questions, making predictions and inferences, and sequencing events in the story. Other children enjoyed finding words with their target sound in them and saying the word. Our clients loved going "apple picking" a few weeks ago! This versatile activity could be used as a turn-taking game or a competitive game used as a reward. Our older kids loved rolling the dice and seeing how many apples they got to pick. We also taped pictures of target words on each apple to help develop speech and language skills. Everyone loved showing off their artistic skills by using a cut apple as a "stamp" to make fall artwork. With this activity, we targeted using 2-word phrases (e.g., "apple on", "red apple", "want paint"), as well as speech sounds. This is also a great activity for practicing beginning s-blends: have the child say "stamp" every time he or she places the apple on the paper. Additional ideas for apples: make applesauce or apple pie, go apple picking, or sort apples based on size, color, and shape. Last week, we talked all about pumpkin growing and pumpkin picking! First we readIt's Pumpkin Time! by Zoe Hall, which is a sweet story about two children and their dog who plant a pumpkin patch every Halloween. We had fun learning new vocabulary words, sequencing pictures from the story, and learning about how pumpkins grow! Even though we don't have our own pumpkin patch, that didn't stop us from making our own "pumpkins"! We used an orange paper bag, real pumpkin seeds, and yarn for the pumpkin pulp to assemble a pumpkin. This activity targeted requesting items needed, answering wh-questions, and using new vocabulary words like seeds, pulp, and stem. Additional ideas for pumpkins: go pumpkin picking, plant a seed and watch it grow, or make "dirt" pudding cups with candy corn pumpkins inside. We hope you've enjoyed a peek into our past few weeks! Stay tuned to find out what we've been up to for Halloween. Don't forget to share this post on Facebook and visit our website (www.slpcenter.com) for more information! Labeling: ask your child to identify the fruits and other food the caterpillar eats. Practice using prepositions: in the egg/cocoon, out of the egg/cocoon,through the food. Categorizing: see how many ways you can group the different foods: type of food (e.g., fruit, meat, dessert), color, shape, or taste. Cause/effect: talk about why the caterpillar was hungry, why he felt sick after eating too much, and why he built a cocoon. Sequencing: use a story strip like the one below to sequence the pictures, then re-tell the story together in your own words. Pronouns: practice saying the repeating line in the story together ("he was still hungry..."). Plurals: practice adding -s to the end of fruit names when there is more than one. Requesting and descriptive language: make your own very hungry caterpillar with an empty egg carton, a pipe cleaner, and some imagination! Have your child ask for various things he/she needs to complete the project. Offer a variety of colors, shapes, and sizes of materials to encourage your child to use descriptive language (e.g., "I want the big, blue cotton ball."). Look for words together that contain your child's speech sound, then practice "reading" the word together. Practice the "th" sound with repeating words like "Thursday" and "through". This is a great story for children learning to say multisyllabic words. Some examples include: caterpillar, chocolate, ice-cream, salami, lollipop, and watermelon. Tap out the words together and see if you can find the one with the most syllables! Talk about healthy foods vs. junk foods with your child. Hypothesize together about why the caterpillar got sick when he ate too much. Introduce your child to new foods using the book. Make a "shopping list" for the caterpillar, then use play foods or go to the store and find the foods he ate. Make a "Hungry Caterpillar" meal or snack together using foods he ate: what about a salami and cheese sandwich or a fruit smoothie? Thanks for reading! Don't forget to share this post on Facebook and visit our website,www.slpcenter.com for more information! Establish a "thumbs up" system. One thumb is "Great trying!" and two thumbs is "Perfect! You did it!" Offer verbal praise: "You're trying so hard! ", "That was so close! ", "Great work!" If they're struggling, give them specific feedback about how to try it next time: "That was a great try! Next time, stick your tongue out a little more!" Thanks for reading! Don't forget to share this on Facebook and visit our website, www.slpcenter.com, for more information! The SLP Center uses Tween Tribune, the news website for kids, in therapy! This website has news articles that are geared towards kids. You can browse the website by age/grade/topic. The articles are easy to read and are not too long. Once the client has finished reading, they can take a quiz with comprehension questions and can leave comments with their thoughts about the article. Here at the SLP Center we use this website to work with our upper elementary school/middle school clients. We use it to address goals including: sequencing, comprehension, answering questions, retelling/recalling information, commenting and conversation skills. Keep an eye out for future posts about how we are using this website in therapy with examples of the comments some of our clients are making! Thanks for reading! Don't forget to share this on Facebook and visit our website,www.slpcenter.com, for more information! Most of you are already spending at least a few minutes every day reading with your child. Why not use this time to address some of his/her therapy goals? Example: While looking at a page of the book, give your child three things to point it: "point to the bird, the house and then the tree". See if he/she can follow all parts of the direction without your help! If your child is working on concepts, choose a book that incorporates these concepts. Be creative and think about books that may allow you to model good speech and language skills for your child, while getting in some reading time too! Whether you are an SLP working with clients in therapy or a parent helping your child work on his/her homework from therapy, board games are a great tool! 2. Choose games with a lot of pieces! For example, the game Bunny Hop, which is picture above. Have the child help you "set up" the game by putting the bunnies in their holes. Before you give the child a bunny have him/her complete a therapy task (e.g. have a list of therapy words for him/her to say, say a target sound in isolation for each bunny, etc...). 3. Throw out the rules! Play the game however you or your child likes without worrying about the rules. The point is to work on therapy targets and have fun so as long as you are doing those two things, the rules don't matter! Thanks for reading! Don't forget to share this on Facebook and visit our website, www.slpcenter.com, for more info! Feeding tip 1: Spread on the flavor. Speech-Language Pathology Center is looking forward to the "I Can't Believe It's Not Butter" farmer's market tour with Suzannah Locketti on Sunday, October 17, 2010. Suzannah has a flair for creating family friendly meals that are health conscious. Combine these tips with therapeutic feeding therapy to facilitate pediatric dysphagia goals.